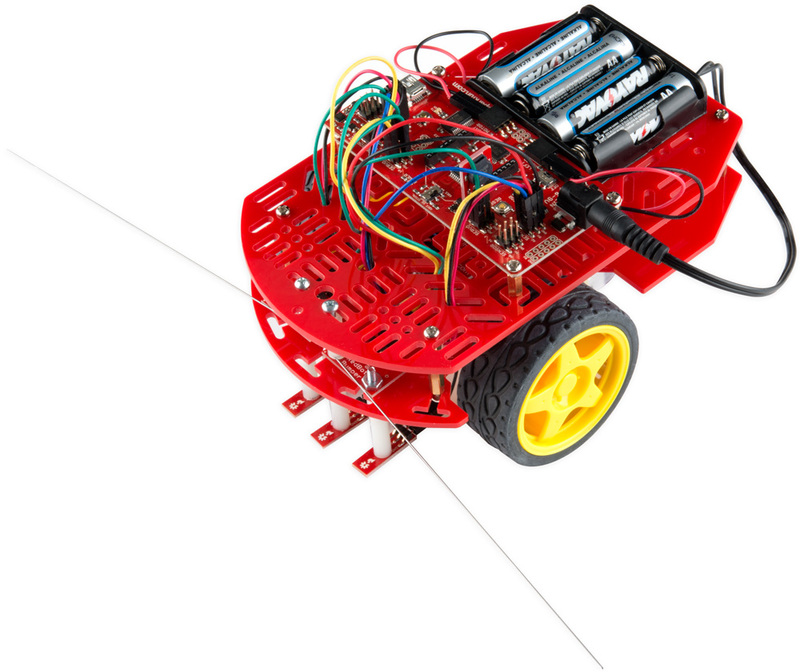 The RedBot is robotic development platform capable of teaching basic robotics and sensor integration! 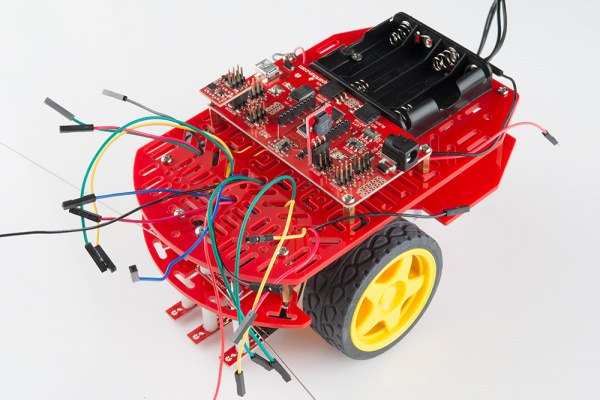 Based on the SparkFun RedBoard and programmable in the Arduino environment, the RedBot has all the I/O you need to make a small robot in no time at all. 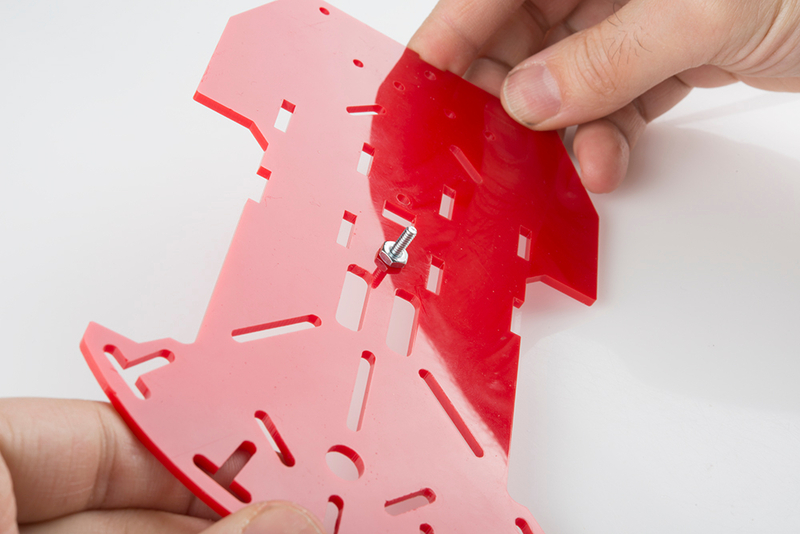 Again, you do not need these parts to assemble your RedBot, but they will be present throughout this guide. 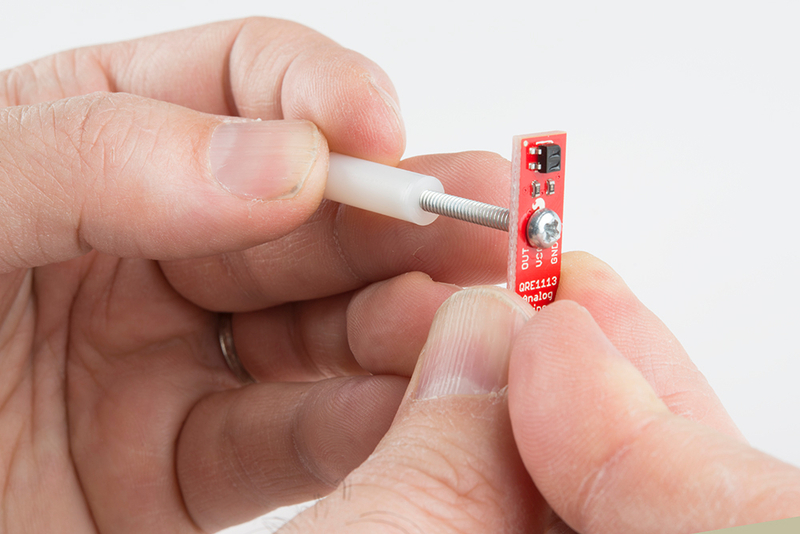 Please ignore any instances of said extra sensors should you not need to assemble them. Sections pertaining strictly to these extra parts will be marked with asterisks. 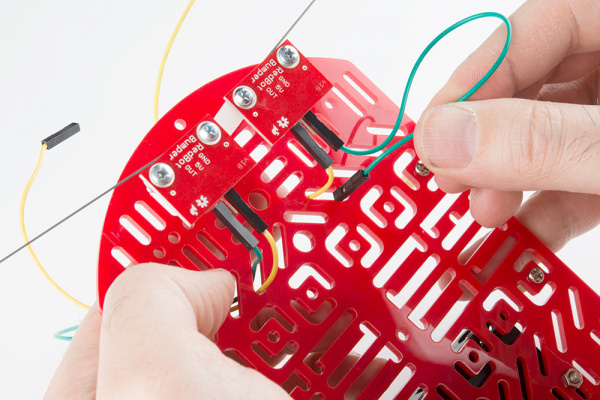 If you are installing one or all of these extras, you may also want to get a few more jumper wires. 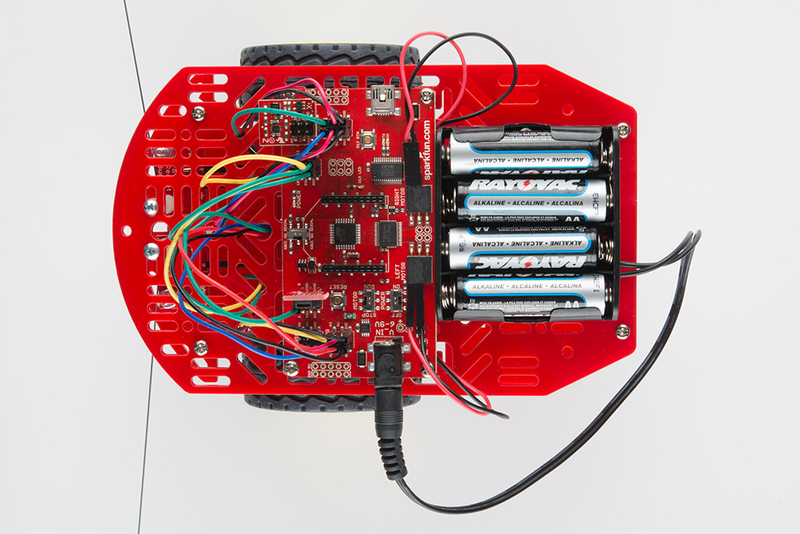 Along with everything listed above, you will also need 4x AA batteries to power your RedBot. 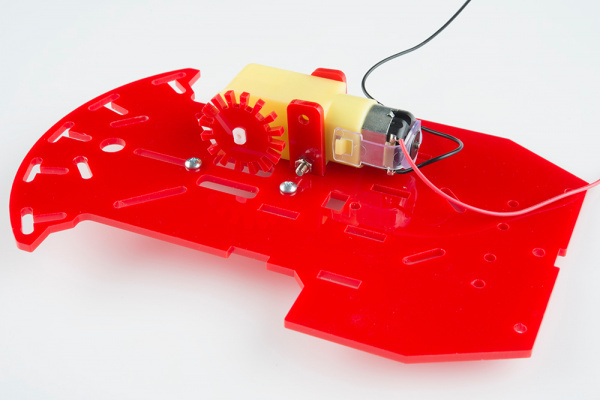 We will be placing screws that will later hold the RedBot Sensor - Wheel Encoder to the bottom chassis. There are different types of screws in this kit. 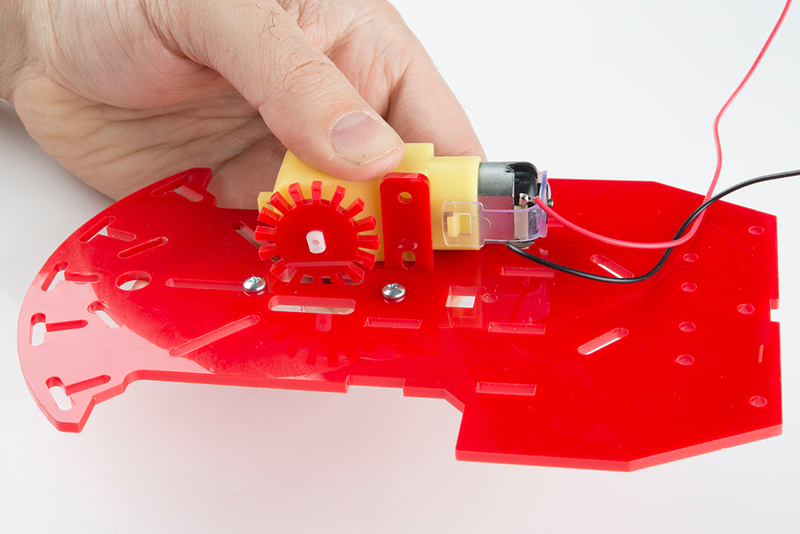 Make sure you use the 4-40 screws and nuts for the RedBot Wheel Encoder. The 4-40 screws and nuts are packaged with the RedBot Sensor - Wheel Encoder. Locate the two positions on the bottom chassis piece where the 4-40 screws will go. In this step, it doesn't matter what side you use, since both sides of the chassis are indential. Place one of the 4-40 screw through the chassis piece in the correct location. This side of the chassis piece will now be your bottom side. Tightly screw down the 4-40 hex nut on the top side of the chassis piece to hold the 4-40 screw down. Place the second 4-40 screw and nut in the second located position on the chassis piece. 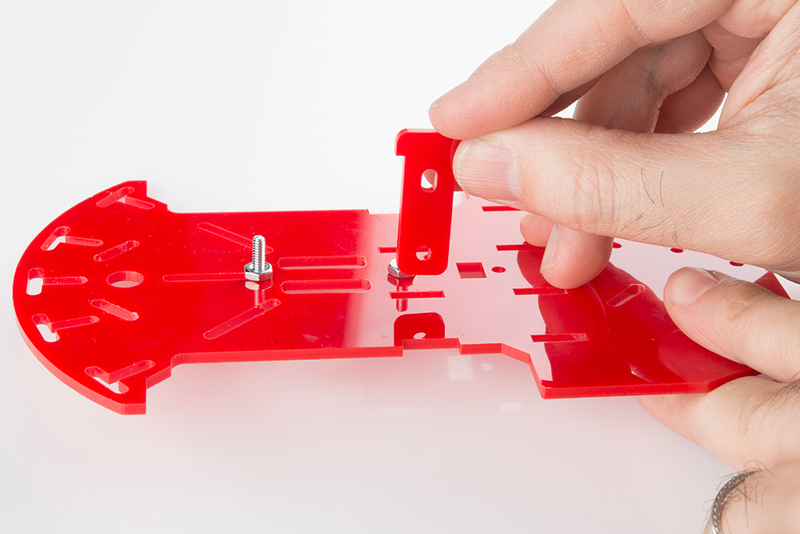 You will want to place the 4-40 screw through the bottom side of the chassis. Then screw in the 4-40 nut on the top side of the chassis. In this section, you will be placing the two motors on the bottom side of the bottom chassis piece. 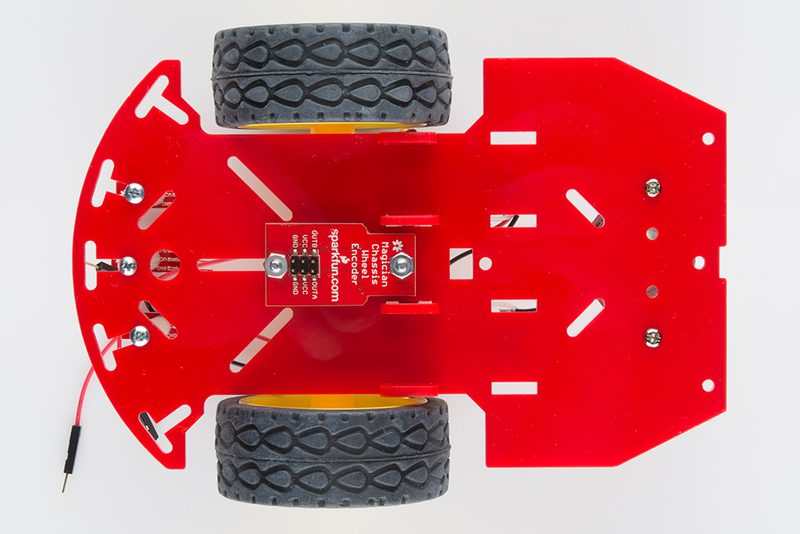 If you are using the RedBot Sensor - Wheel Encoder, please play close attention to what chassis side you are placing the motors on. Locate the correct location on the bottom chassis piece. Place one of the motor holders through the right opening in the chassis. 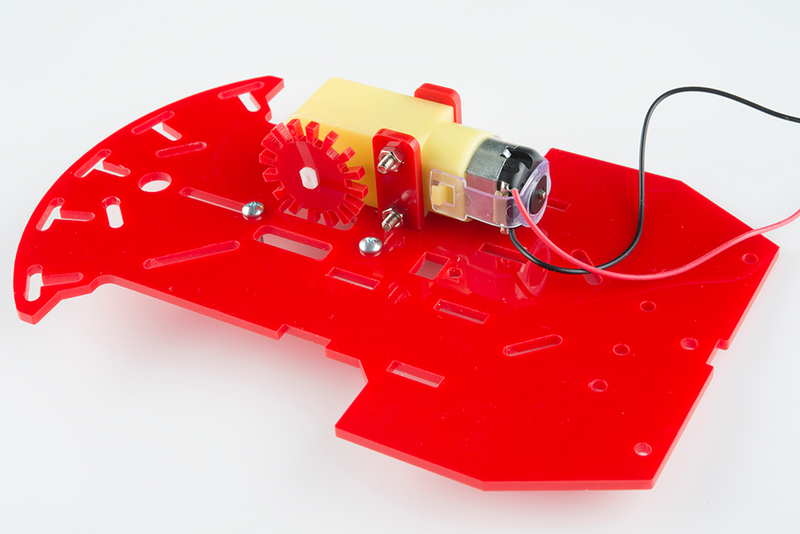 If you are using the RedBot Sensor - Wheel Encoder, make sure you are on the top side of the chassis piece. The top side will have the 4-40 hex nuts showing. Push the motor holder all the way down. If you did not install the encoder screws from the previous section, you can ignore the screws in these photos. Place the first motor on the bottom side of the chassis piece. Line up the two motor holes with the two motor holder holes. 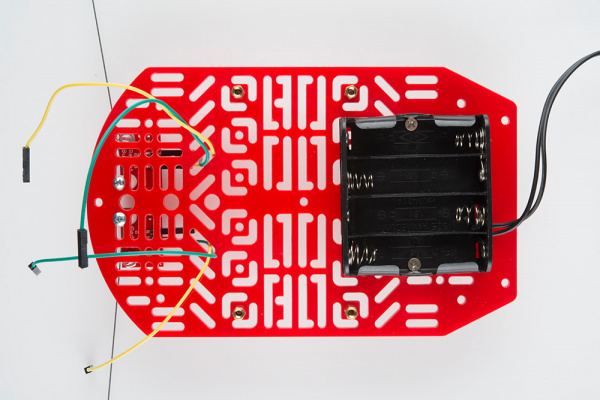 Make sure that the red wire is on top and away from the chassis piece. 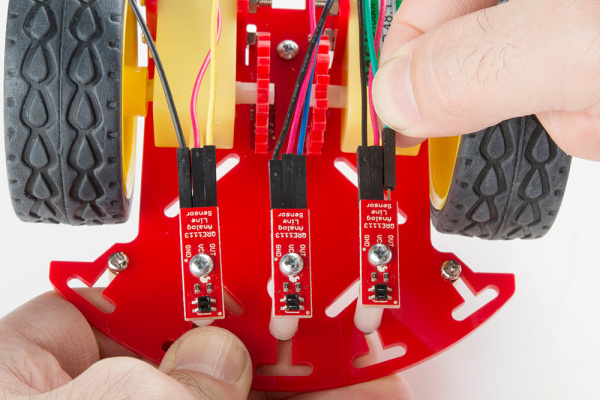 If you are adding wheel encoders to your RedBot, do so now. If not, ignore the encoder (the red gear looking piece) in the following pictures. Make sure the encoder wheel fits in the chassis opening without touching the opening's sides. 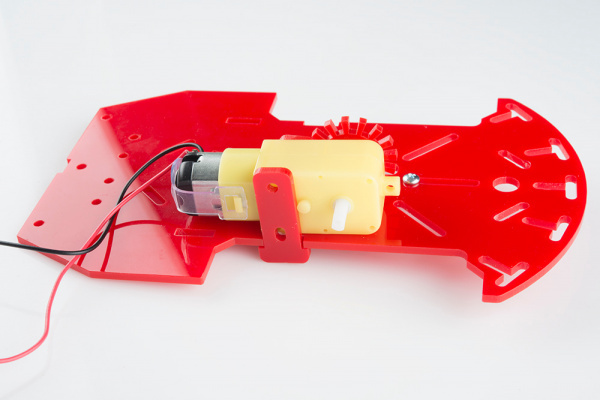 Now you can add the second motor holder on the opposite side of the motor. Place M3*30 screw through the two motor holders and the motor. The M3*30 screw head should be on the outside edge side of the chassis. 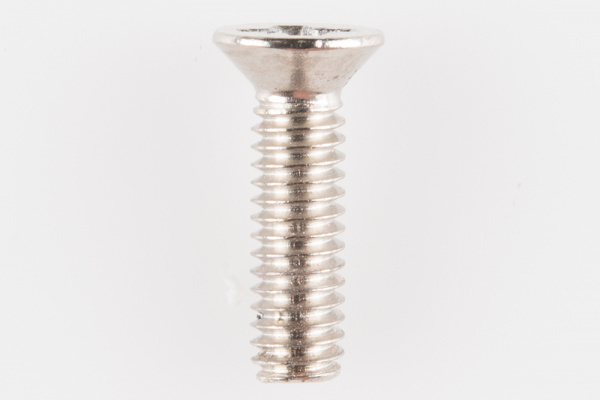 Add a M3 nut to the M3*30 screw. Do not tighten down the nut all the way yet. Add the second M3*30 screw and M3 nut to the second hole openings. Now you can tighten both nuts. 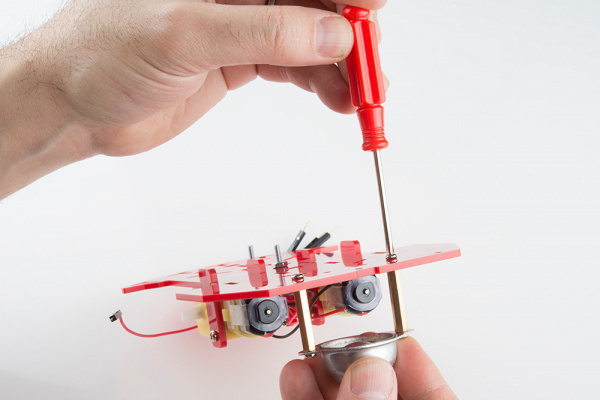 It helps to hold the nut steady and turn the screw with the screwdriver, threading the screw into the nut. Using the same steps as above, you can now add the second motor on the opposite end on the same bottom side of the chassis piece. 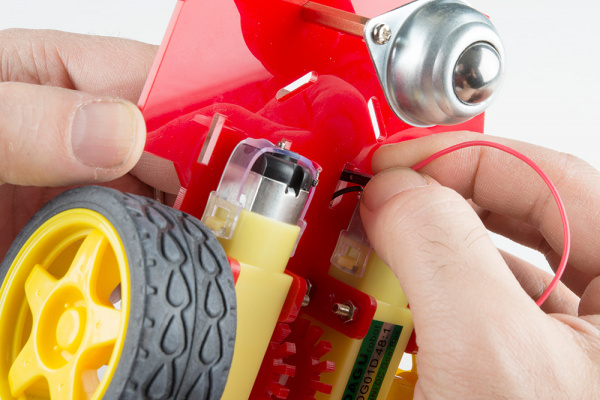 You might find it helpful to add the encoder wheel to the motor before placing the motor in the correct spot. 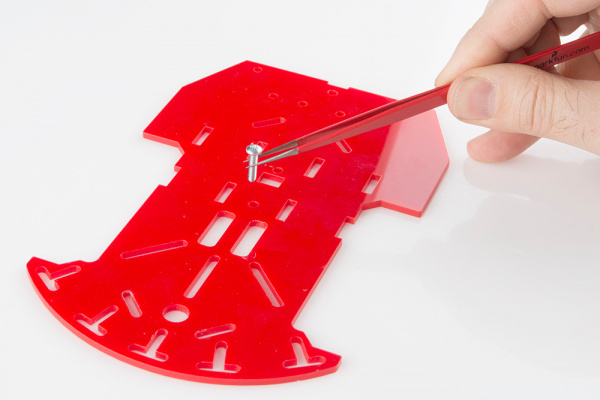 In this section, you will be adding the ball caster to the bottom side of your bottom chassis piece. 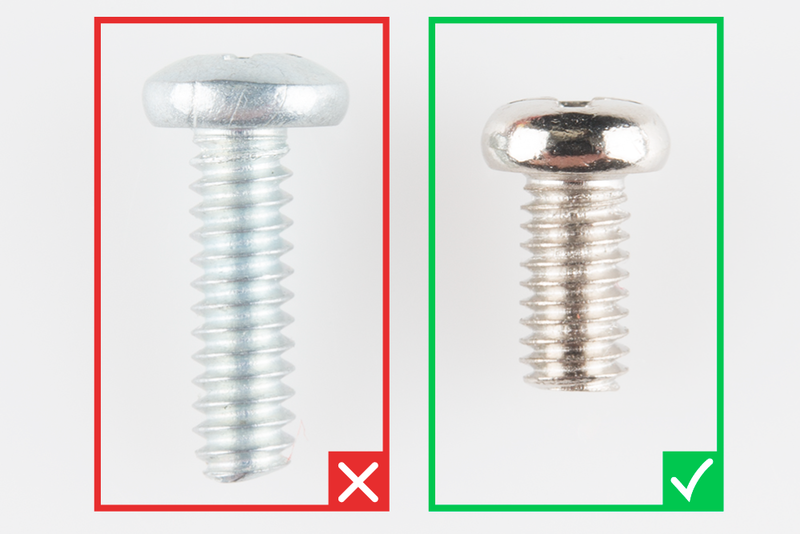 There are different types of screws in this kit. Make sure you use the M3*6 screws for this section. 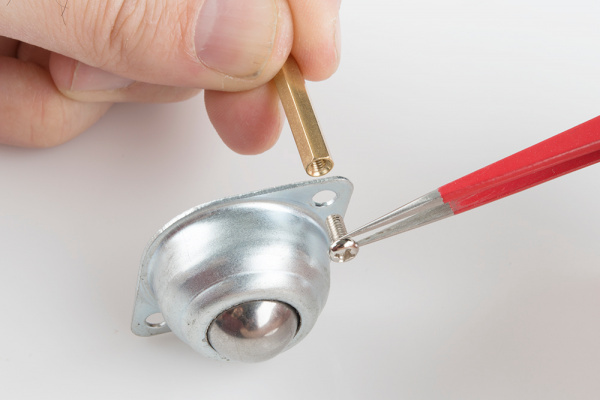 Place a M3*6 screw through one of the ball caster's holes. 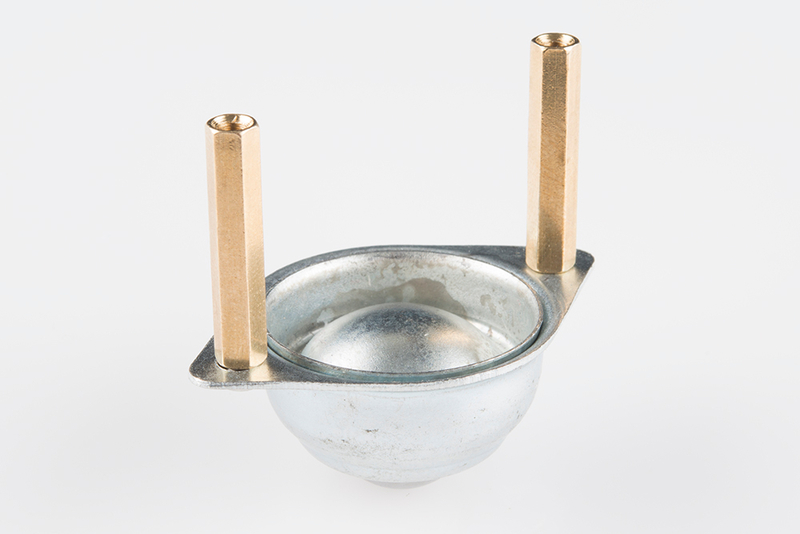 The screw's head should be on the same side as the ball caster's metal ball. Then screw in one of the L25 standoffs to the ball caster. Please note: the L25 metal standoffs will be longer then the L10 metal standoffs. Using a M3*6 screw, screw on the second L25 standoff on the other side of the ball caster. Locate the two positions on the chassis piece where you will be screwing down the ball caster. 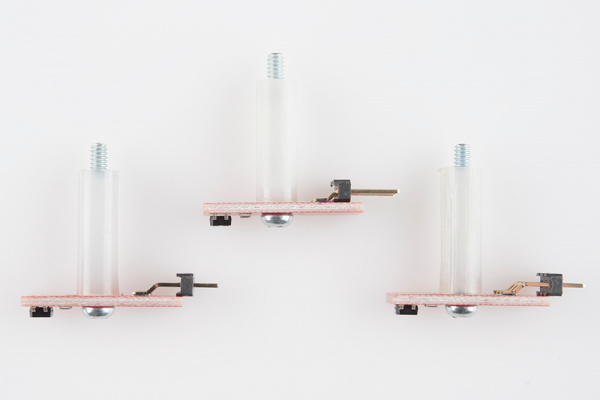 Now you can use two M3*6 screws to tighten down the ball caster to the bottom side of the chassis piece. 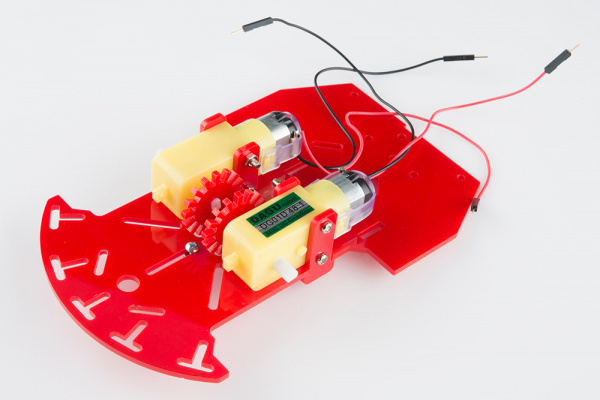 The ball caster should be on the same chassis side as the motors. 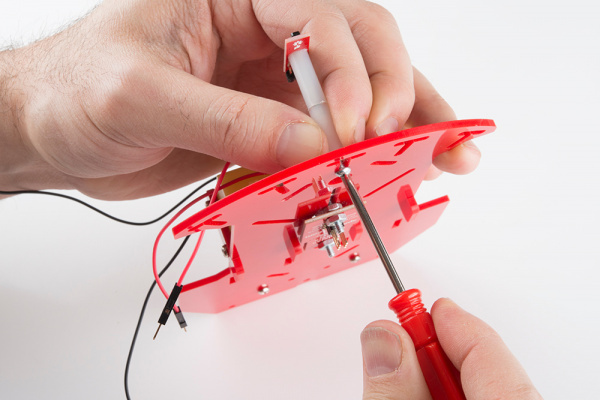 If you are using the RedBot Sensor - Wheel Encoder, in this section you will be tightening down the RedBot Sensor - Wheel Encoder to the bottom chassis piece. 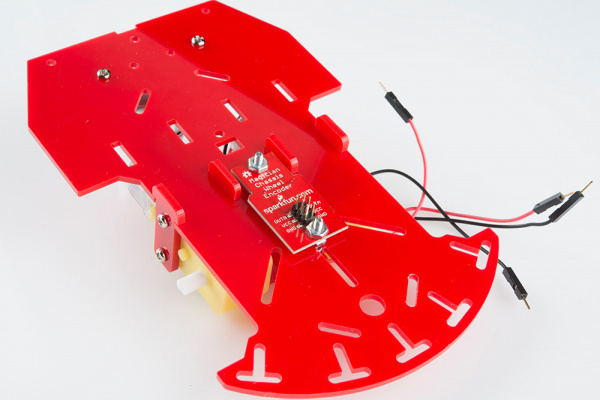 With the six pin male header side on the RedBot Sensor - Wheel Encoder facing upwards, place down the encoder on the top side of the bottom chassis piece. Pay close attention that the six pin male header side is also closest to the front side of the chassis. 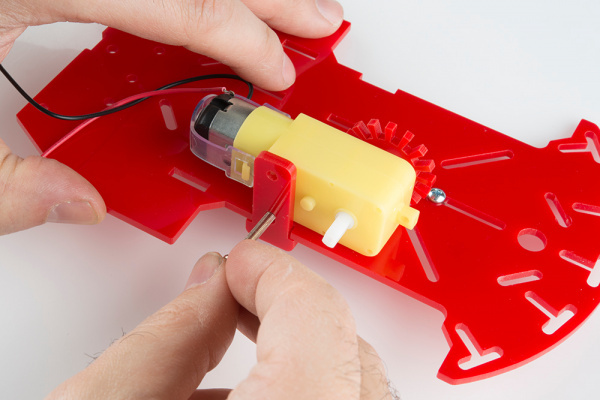 Using two 4-40 hex nuts, tighten down the RedBot Sensor - Wheel Encoder on the top side of the bottom chassis piece in the same location in the earlier "Wheel Encoder Screws" section in this assembly guide. 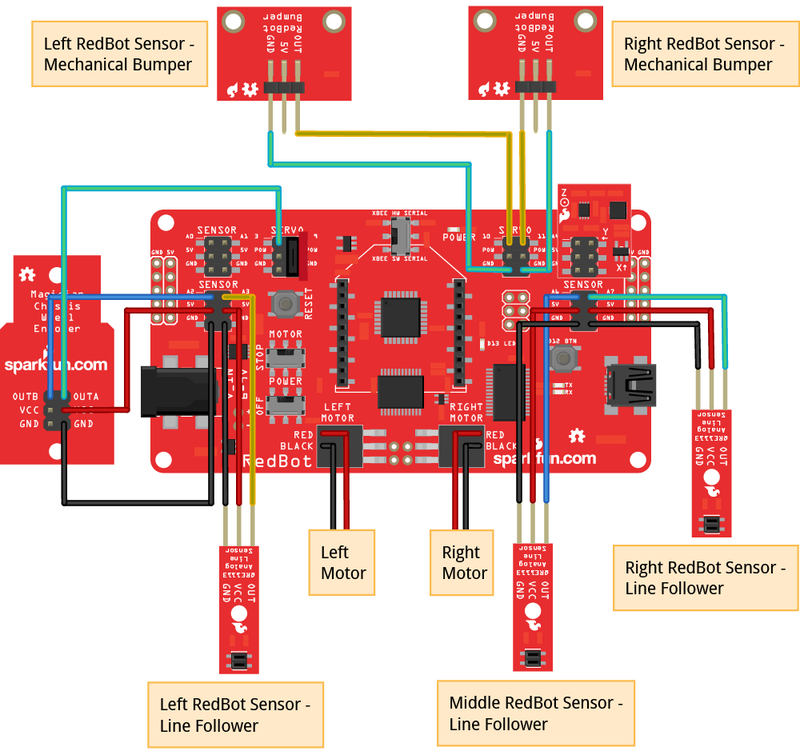 In this section, you will be putting standoffs on the RedBot Sensor - Line Followers. 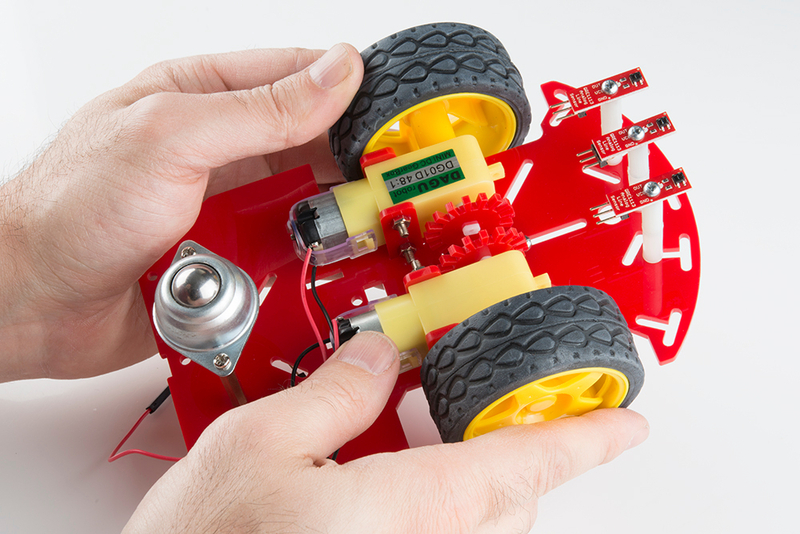 Then you will add the sensors on your chassis. 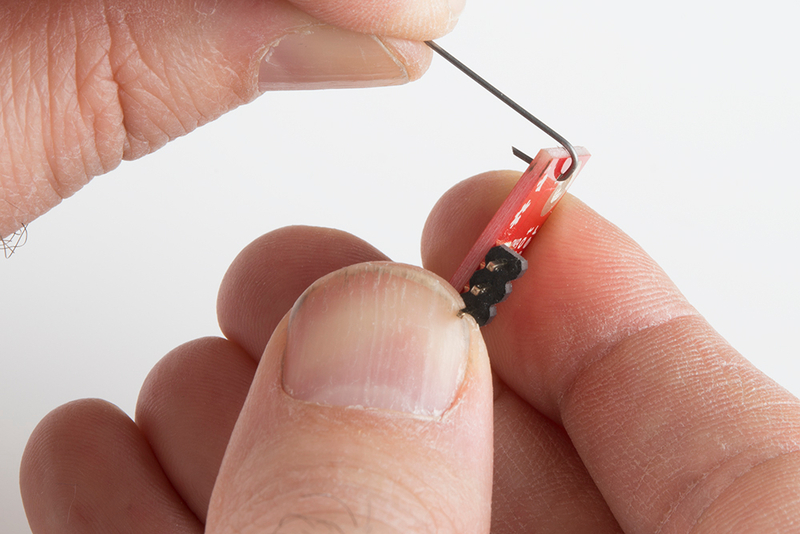 Screw a 4-40 1" Phillips screw to the plastic standoff through one of the RedBot Sensor - Line Followers. Make sure to tighten the standoff on the line follower's header side. The top of the screw should be on the same side as the RedBot Sensor - Line Follower's sensor. 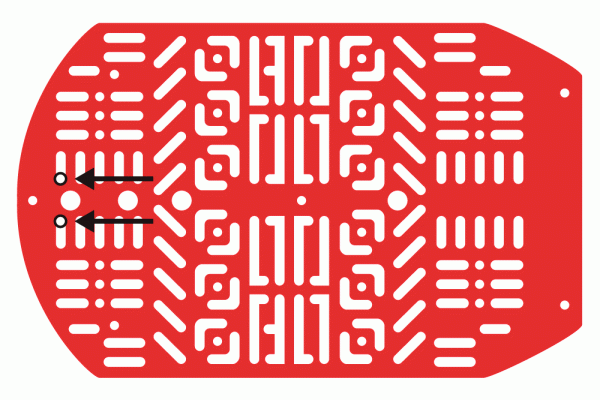 Do this for the other two RedBot Sensor - Line Followers. You should see part of the 4-40 1" Phillips screw sticking out. You will screw on another standoff on top of the one already on the screw. The screw's end should now be covered as pictured below. Do this for all other two RedBot Sensor - Line Followers. Locate three spots on the chassis where you will be adding the RedBot Sensor - Line Followers. Place a 4-40 1/4" Phillips screw through the top side of the chassis piece. 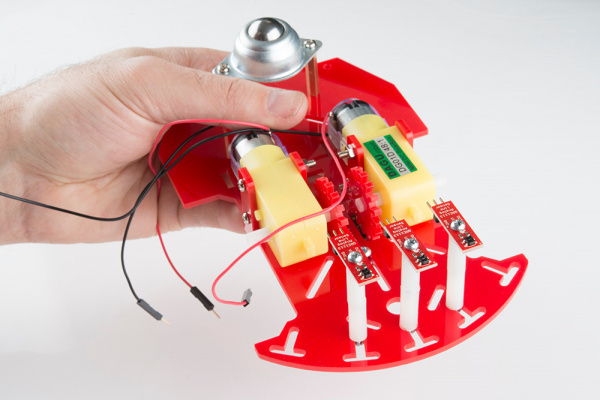 Tighten down the standoff with a RedBot Sensor - Line Follower into bottom chassis piece. The RedBot Sensor - Line Follower should be on the bottom side of the chassis piece. 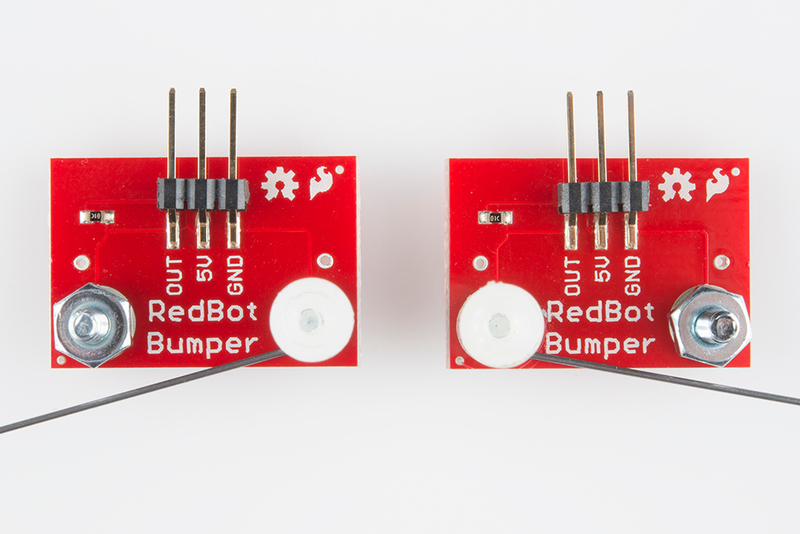 The headers on the RedBot Sensor - Line Follower should be pointing in towards the chassis. Using your other two 4-40 1/4" Phillips screws, hand tighten the other two RedBot Sensor - Line Followers in the suggested locations. In this section, you will be putting two wheels on the RedBot motors. Place the two tires on the ends of the motors. Make sure the tires are on all the way. 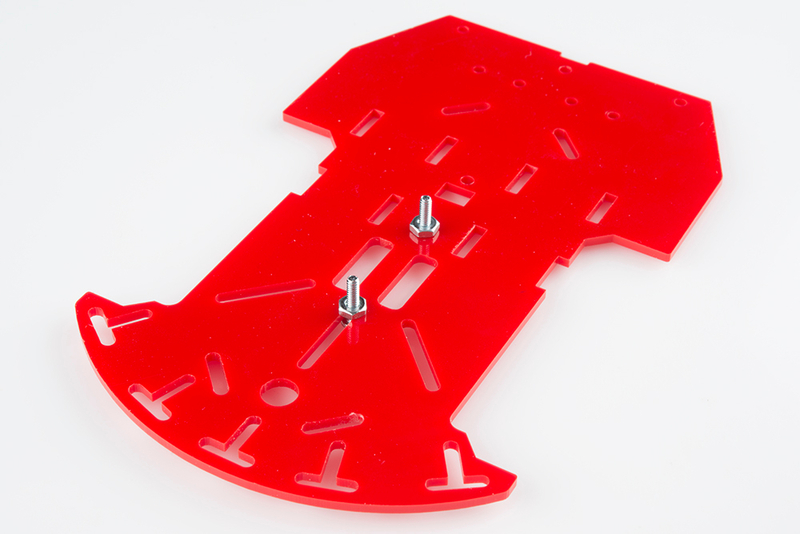 In order to connect the top chassis piece to the bottom piece, you will need to put stand offs between the two chassis pieces. 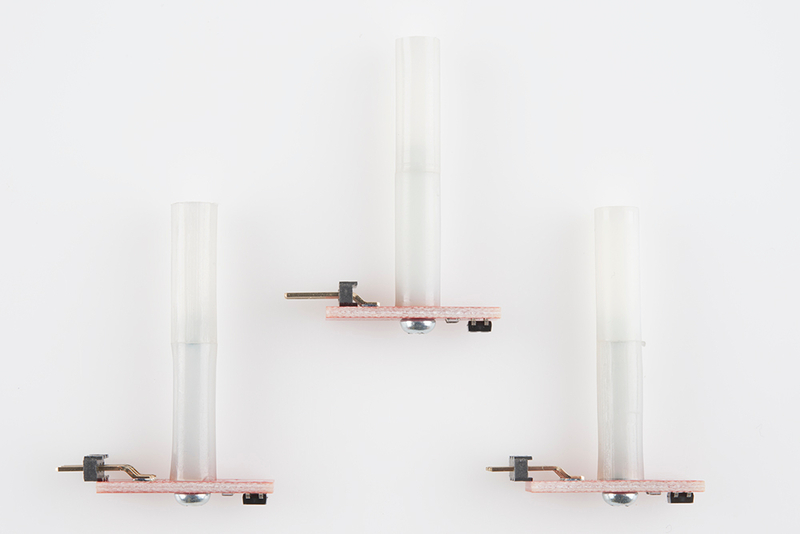 Follow along to see the best locations to place the metal stand offs. Locate the four L25 metal standoff locations. 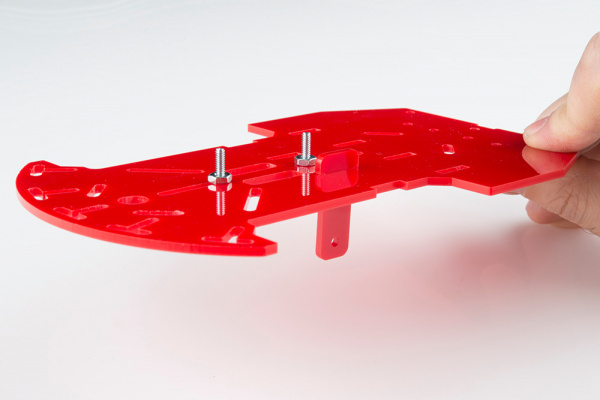 Using M3*6 screws, tighten down all four metal standoffs on the top side of the bottom chassis piece. 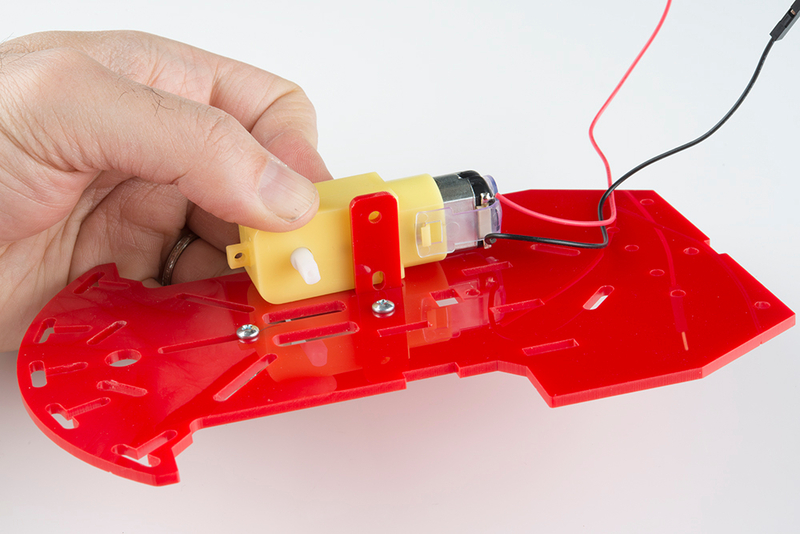 Before connecting the top chassis piece to the bottom piece, you will want to add the battery holder. Locate the M3*10 flathead screw. Locate two positions on the top chassis piece for the M3*10 flathead screws. Screw down the battery holder. Make sure they are screwed down nice and tight on the top chassis. 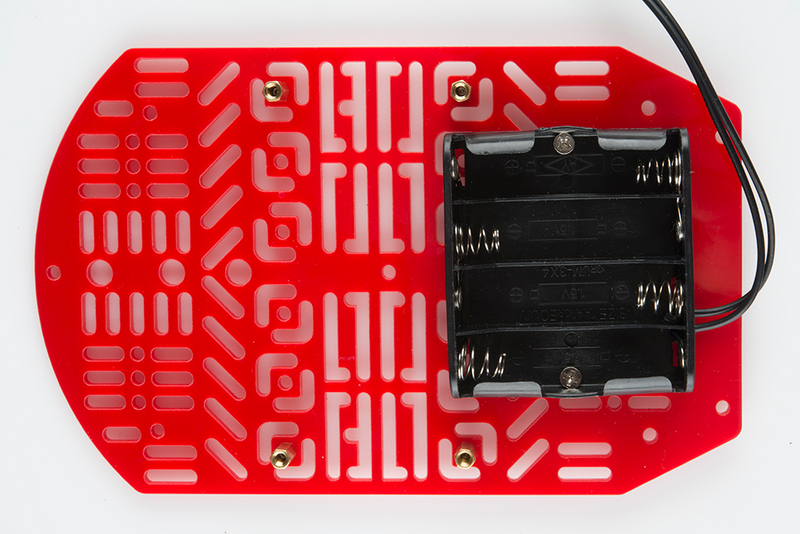 Since the battery holder is screwed down, it is now easier to add the metal L10 standoffs in the locations where the RedBot Mainboard will go. Locate the following locations on the top chassis piece where you will add four L10 metal standoffs. 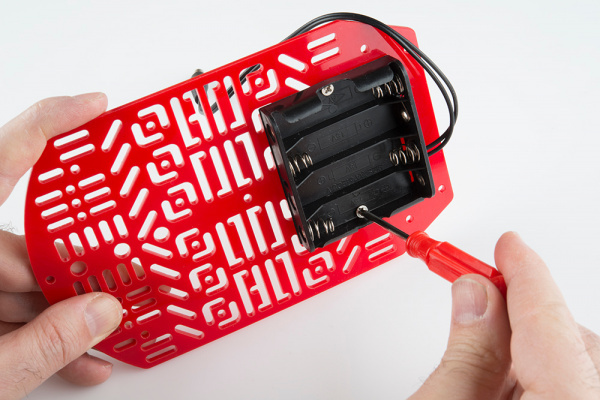 Using the M3*6 screws, add all four L10 metal standoffs on the top chassis piece with the L10 metal standoffs located on the same side as the battery holder. 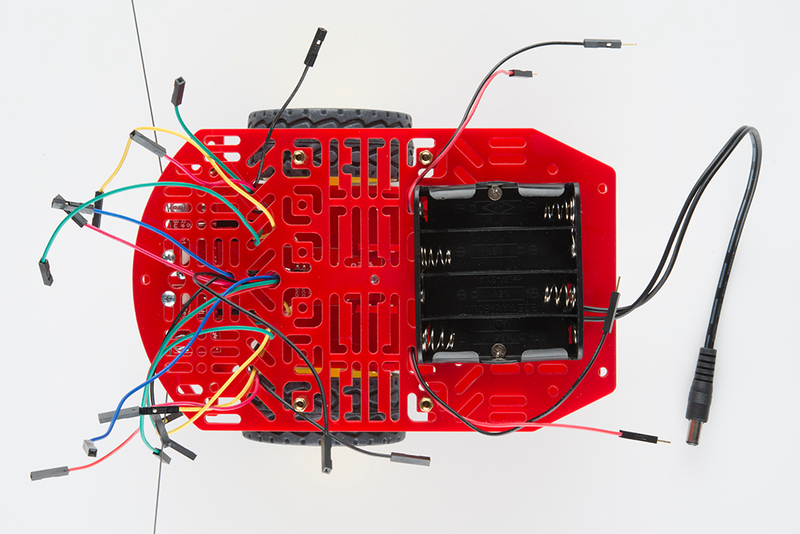 It will make it easier to connect the sensors to the RedBot mainboard later if you add the jumper wires to the Line Followers and Wheel Encoder (if you installed in earlier) now, before screwing down the top chassis piece. The motors already have wires, so you won't have to add more jumper wires. You will need to place the motor jumper wires through the chassis's openings. Connect one end of the jumper wires to each one of the Line Followers' header pins. Keep in mind you are able to use any jumper wire colors. However, following along with the jumper wire colors this assembly guide may be helpful if this is your first time assembling the RedBot. 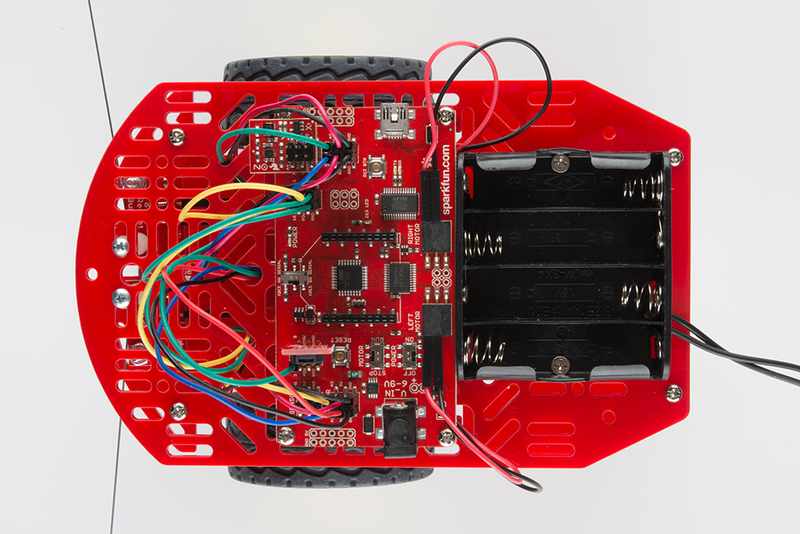 See below if you are following along with the jumper wire colors to help lessen confusion when hooking up to the RedBot Mainboard later in the guide. Make sure to push the jumper wires in all the way. Stick the Line Followers' jumper wires through the top of the bottom chassis piece. Add four jumper wires to the RedBot Sensor - Wheel Encoder. There should be a jumper wire each one of the following pins: OUTB, OUTA, VCC, and GND. 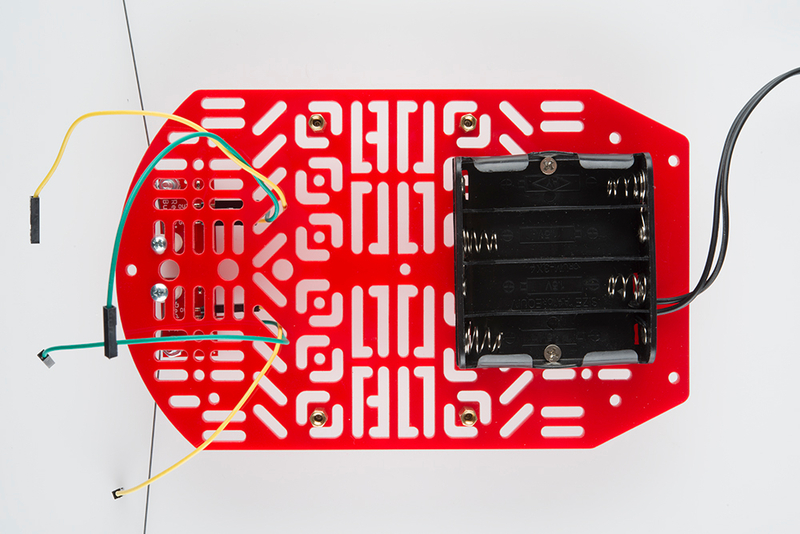 See below if you are following along with the jumper wire colors to help lessen confusion when hooking up to the RedBot Mainboard later in the guide. Remember that the color of the jumper wire doesn't matter, and this is only to be helpful in knowing which jumper wires go to which pins. You will need to prepare the music wire by bending the wire itself. Then, you will add standoffs and screws to your bumpers. It is easy to bend the wire with needle nose pliers. 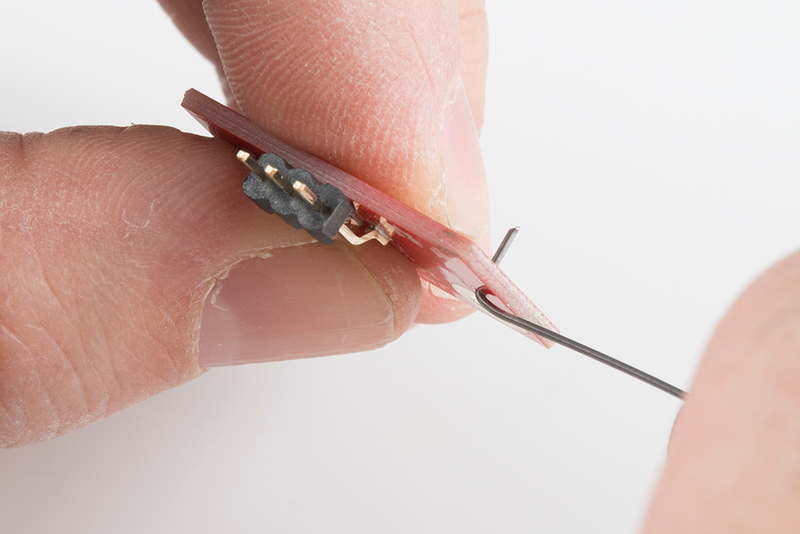 However, there is a trick to bend the wire using the Mechanical Bumper PCB itself. First, stick one of the wires through one of the small side holes. It only needs to stick out a little bit. Bend the wire 90 degrees. Bend the wire 90 degrees again. Now that the wire is bent, take the wire out of the PCB hole. Screw down one of the 4-40 screws through the bottom side of one of the bigger holes on the Mechanical Bumper. 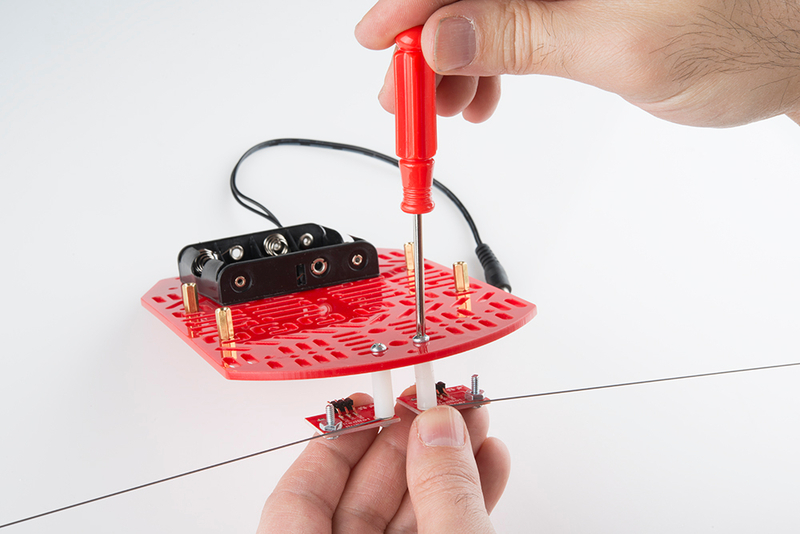 Then add a 4-40 screw from the bottom and loop the bent wire around the screw. 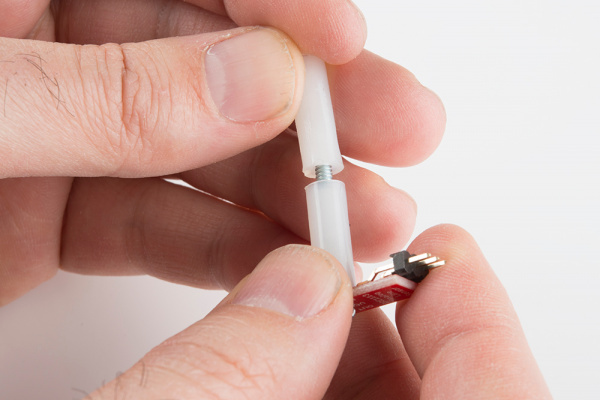 It is very important that you do not let wire touch the other side's nut and 4-40 screw, since that is what triggers the sensor. Leave a little space between the wire and other side's nut. Twist on a nylon standoff on top of the screw to secure the wire. Double check that the wire does not touch the other side's nut and 4-40 screw. Take note of which side your nylon standoff is on for the first Mechanical Bumper. Do the opposite for the other bumper. Double check that there is one Mechanical Bumper that has a nylon standoff on the right side of the "RedBot Bumper" silkscreen and one that has a nylon standoffs on the left side. In this section, you will need to screw the Mechanical Bumpers into place on the front end of your RedBot chassis. Locate the two positions on the top chassis piece. 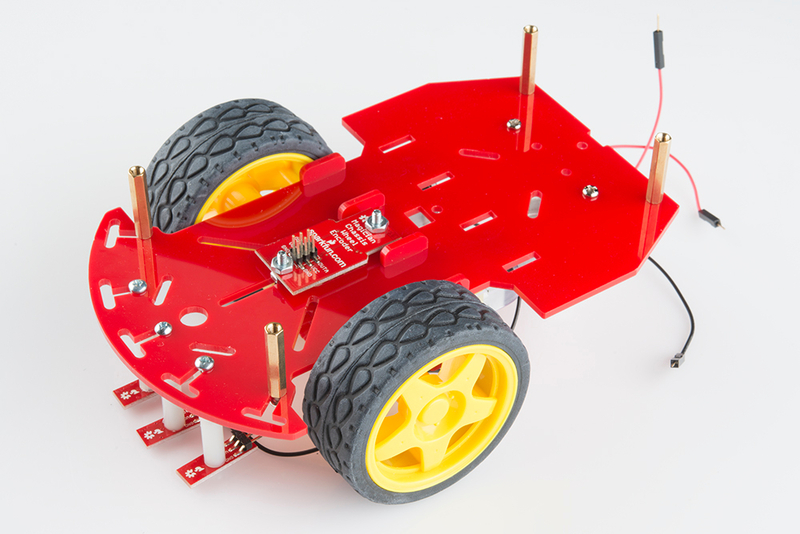 Using two 4-40 1/4" screws, tighten down the Mechanical Bumpers, with the two wires pointing in opposite directions, on the bottom side of the top chassis piece. The Mechanical Bumpers' header pins should be pointing towards the chassis piece. 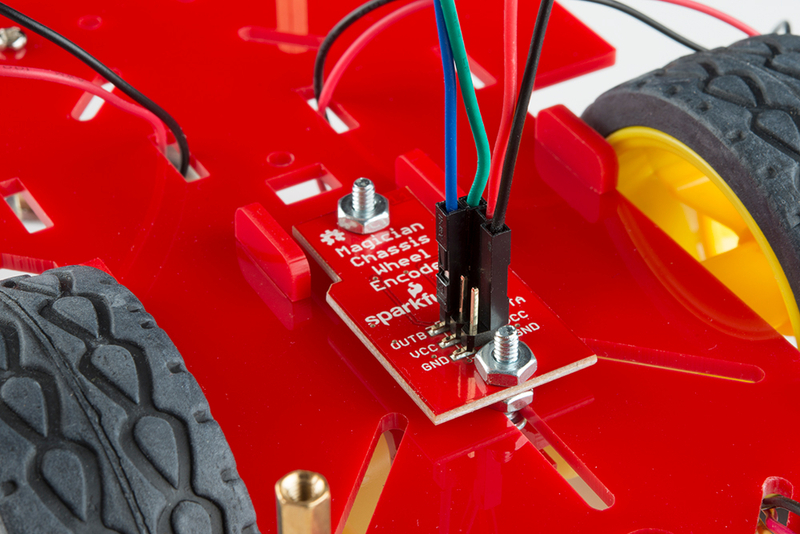 Add jumper wires to the GND and OUT pins on both of the Mechanical Bumpers. 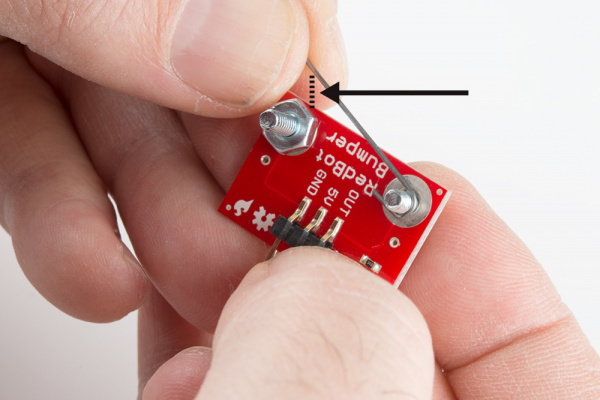 You will not add jumper wires to the 5V pins. Again, which color jumper wires you choose does not matter, but it might be helpful to follow along with this assembly guide. Put the other ends of the jumper wires through the top chassis piece. Make sure the jumper wires are all the way through. Now it is time to connect the top chassis piece to the bottom chassis piece. First, push all the jumper wires through top chassis piece. After all the jumper wires are through the top, you can screw down the top chassis piece to the four L25 metal standoffs already on the bottom chassis piece. You are now ready to add the RedBot Mainboard to the four L10 metal standoffs on the top chassis piece. Place the RedBot Mainboard on the top of the L10 metal standoffs. 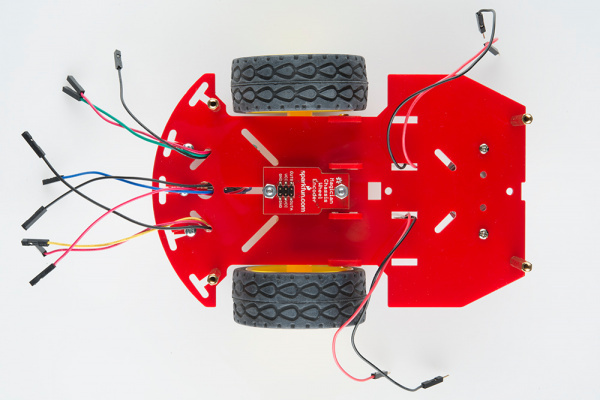 When looking down on your RedBot, the battery pack will be on the top end, the RedBot Mainboard's power jack will be on the right side, and the USB will be on the left. 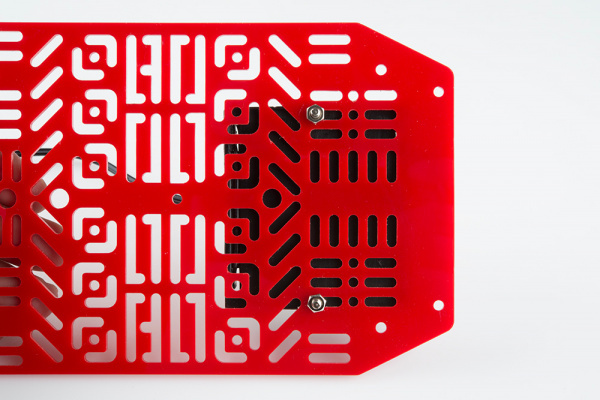 Using four M3*6 screws, screw down the RedBot Mainboard to the L10 metal standoffs. Time to add the Accelerometer! 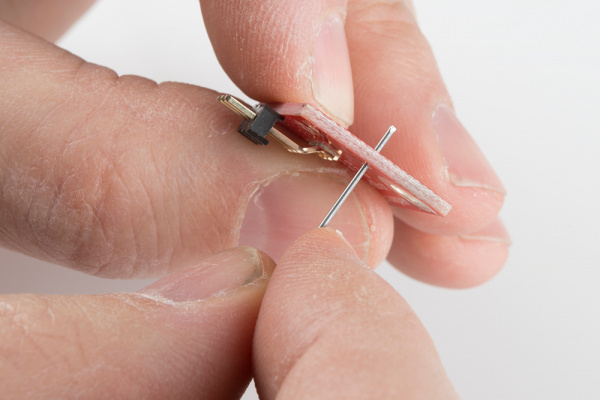 If you do not have headers on your Accelerometer already, we recommend soldering on female headers to your Accelerometer to fit on top of the RedBot Mainboard's female headers. Locate the position on the RedBot Mainboard to add the Accelerometer. Line up the "A4" pin on the Accelerometer to the "A4" male header pin in the "SENSOR" section on the RedBot Mainboard. 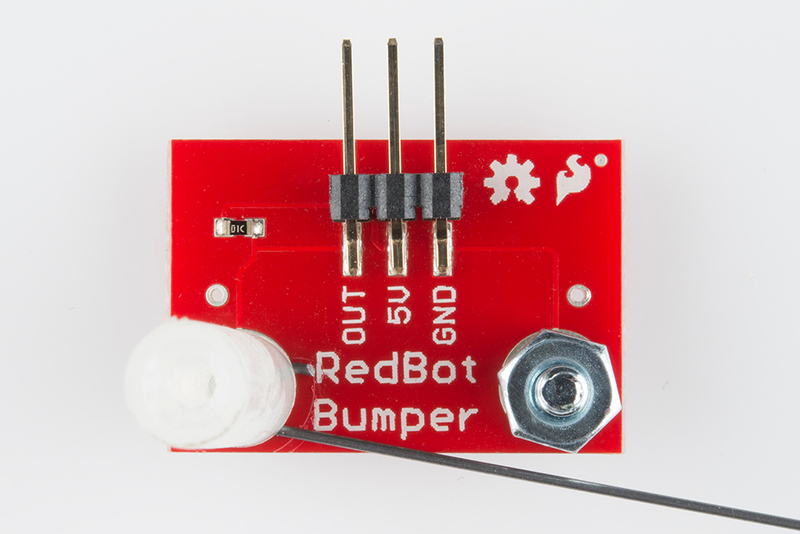 Adding the RedBot Buzzer is nice and easy! Locate the position on the RedBot Mainboard to add the RedBot Buzzer. With the buzzer side and female header PCB side of the RedBot Buzzer facing to the left, place the RedBot Buzzer on top of the "9", "POW", and "GND" male header pin row in the "SERVO" section on the RedBot Mainboard. 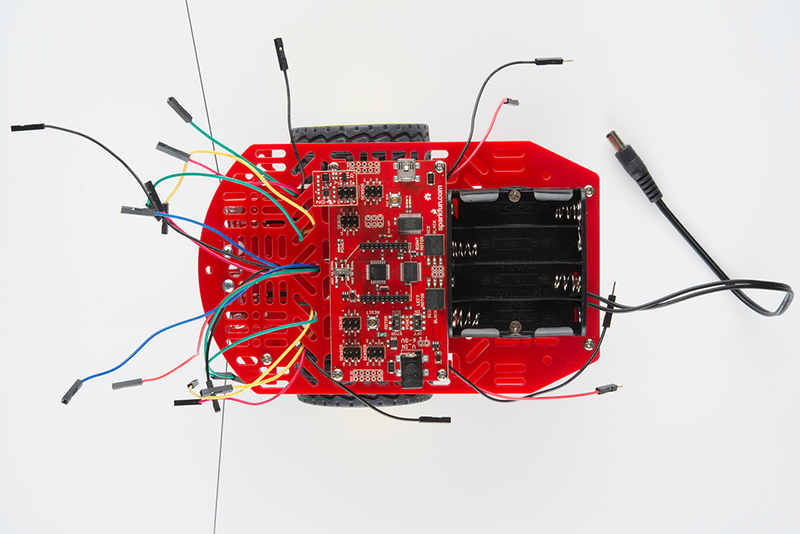 It is time to hookup all the jumper wires to the RedBot Mainboard! Play close attention when connecting the jumper wires to the RedBot Mainboard. It is very important that the motors and add-ons are connected to the right pins. Please note, the jumper wire colors is only to help find which jumper wire goes to which pin, if you have been following along with this guide. The color of the jumper wire do not matter otherwise. 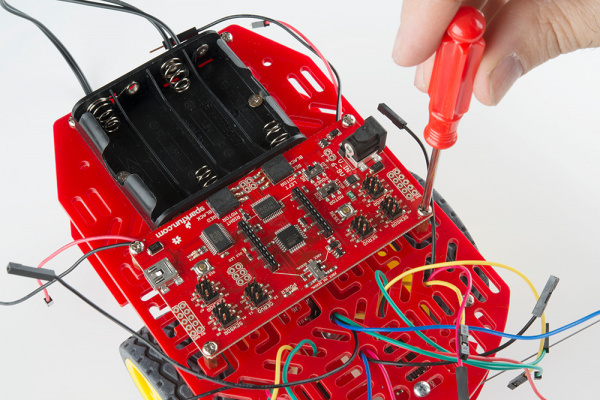 What matters is that the correct pins on the RedBot add-ons are connected to the right pins on the RedBot Mainboard. 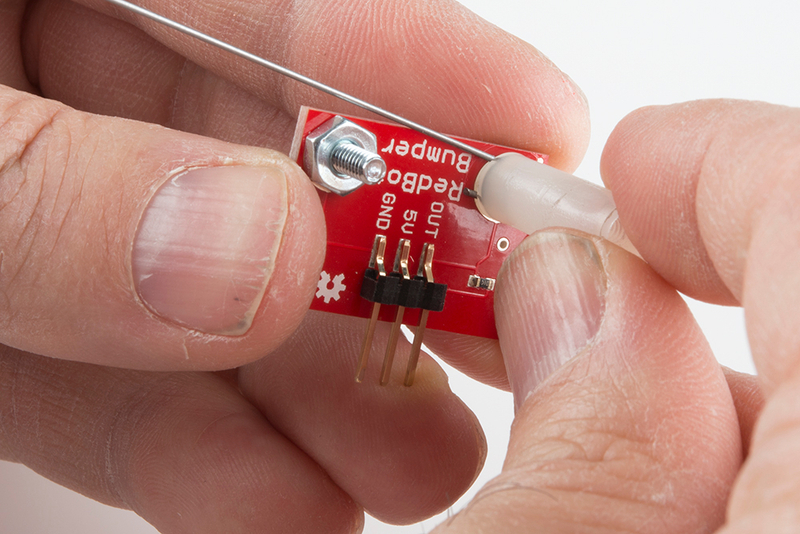 Ignore any sensors you omitted from your build. The only wires left should be for the motors. 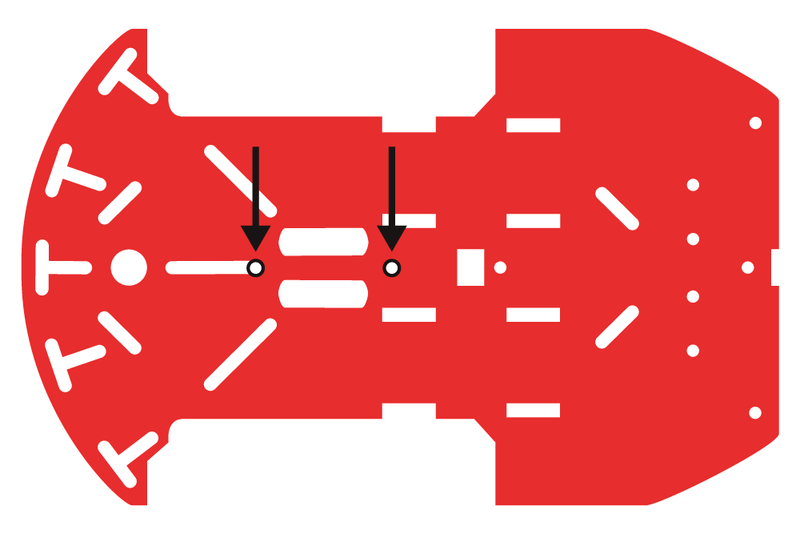 Connect the left motor's red wire to the RedBot Mainboard's "RED" female header pin in the "LEFT MOTOR" section. Connect the left motor's black wire to the RedBot Mainboard's "BLACK" female header pin in the "LEFT MOTOR" section. Connect the right motor's red wire to the RedBot Mainboard's "RED" female header pin in the "RIGHT MOTOR" section. Connect the left motor's black wire to the RedBot Mainboard's "BLACK" female header pin in the "RIGHT MOTOR" section. Just add batteries, and you are done putting together your RedBot! Use the graphics on the Battery Pack Holder to place the batteries in the right orientation. 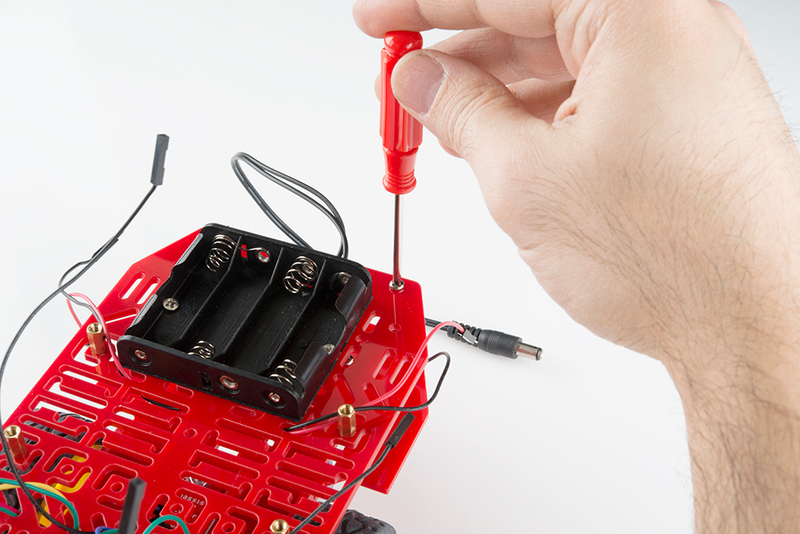 Plug in the Battery Pack Holder's barrel power plug into the barrel power jack on the RedBot Mainboard. Ready to start driving your RedBot? Check out the Getting Started with the RedBot!